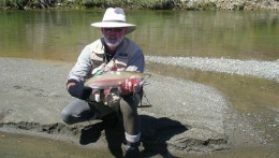 Simon has a strong passion for all types of fishing and hunting and loves nothing more than to be out on the water. 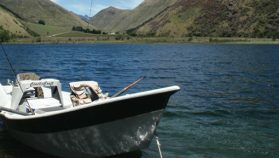 If he is not out on a charter then you will probably find him out on a boat at the coast fishing! 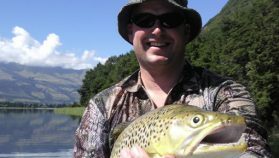 Simon has over 25 years fishing experience in and around the Southland and Otago regions. Features: 7.8m/26ft Searanger Alloy Hard Top – powered by a 230HP KAD43 Volvo diesel inboard. The newest addition to the fleet, it is suitable for groups of 1 – 12. 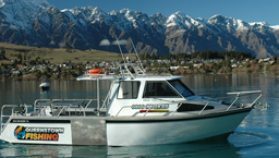 Superior vessel Nikita is comfortable and well appointed offering the following; BBQ, diesel heater, toilet and protection from the weather – ensuring your satisfaction and enjoyment. Features: 6m/20ft Rayglass 620 Legend – powered by a 150HP, Mercury Optimax outboard. Kathleen II, the perfect vessel for smaller groups, can accommodate 1 – 6 passengers. 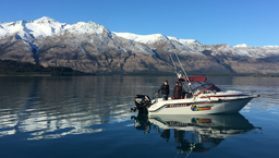 In addition to our powered charter boats, Queenstown Fishing offers a stealth angling machine in the form of a purpose built drift boat – an excellent way to catch the fish off guard in those hard to get to top spots.